This healthy Beetroot Paratha goes well for breakfast or lunch box for kids as well as for adults too. Beetroot is good for eyes as it is rich in vitamin A and iron. Serve this beetroot paratha with coriander chutney, pickle or curd. Beetroots have always been included most recommended vegetable list, it is one of the most essential ingredients used to make a detox salad. Beetroot has sweet, earthy flavor, also it is a powerhouse of many nutrients that help to improve your health. 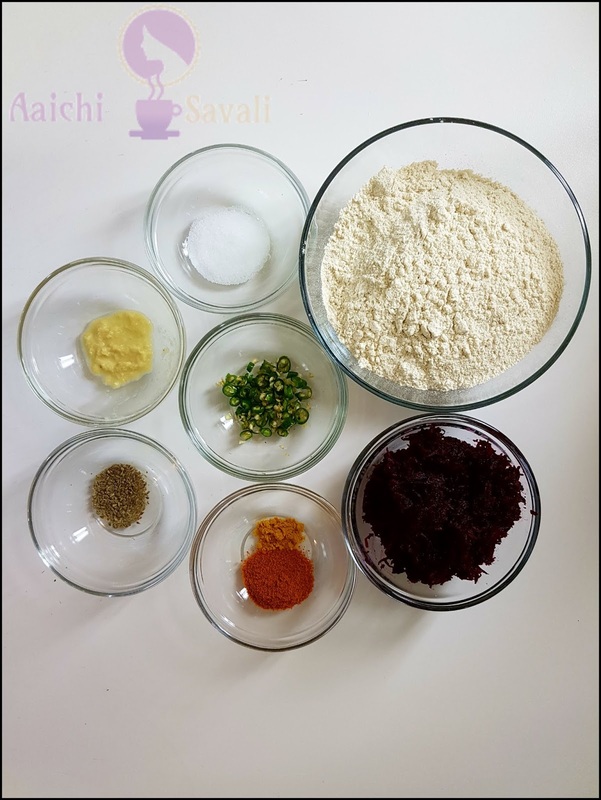 Each Beetroot Paratha Contains 124 Cal. 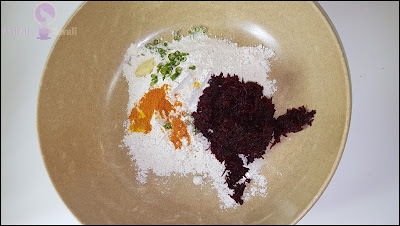 In a mixing bowl add wheat flour, grated beet, green chilies, red chili powder, salt, turmeric powder, ginger and carom seeds, mix all well and by adding water knead to make a soft dough. Divide the dough into equal parts and make paratha from it. Roll the paratha and roast it on hot pan or tawa to both the sides with oil. pudina chutney or with plain curd, pickle. 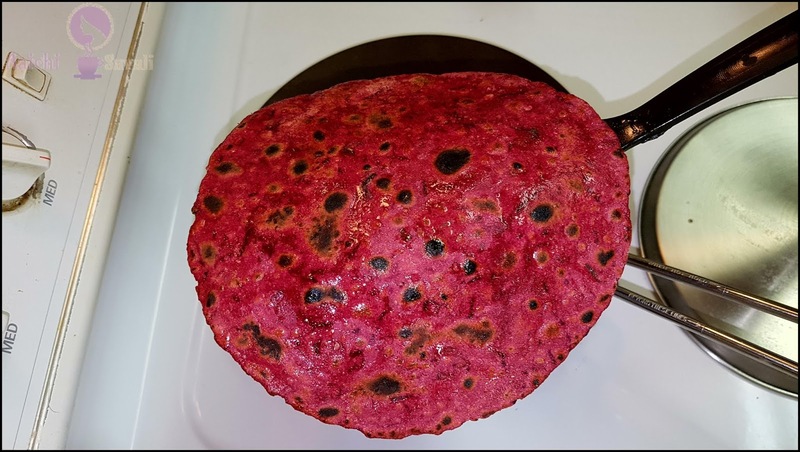 Here, healthy, tasty and nutritious beetroot paratha is ready to serve. Enjoy!!! source of vitamins and minerals, it contains Vit.A - 13.6 %, Vit.C - 9.2 %, Iron - 5 %. 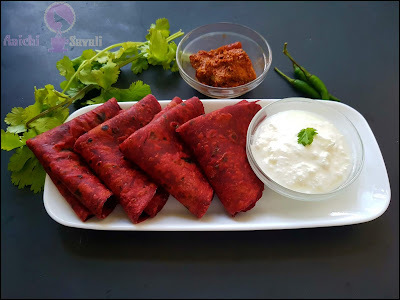 Beetroot paratha is a rich source of many valuable nutrients and fiber. Vitamins: Beets also contain the vitamin B, vitamin folate, which helps reduce the risk of birth defects. Maintain blood pressure: nitric oxide present in beetroot helps to relax and dilate your blood vessels, improving blood flow and lowering blood pressure and reduce the risk of heart disease and strokes. Beets supports in detoxification and helping to purify your blood and your liver. Beetroot is low in sodium and fat, they also are an excellent source of folate, and hence support mental and emotional health. Digestion: regular consumption of beet has been found to improve digestion and blood quality. Beetroot is the most abundant source of iron, which helps to prevent anemia and the absorption of iron is better from beetroot than a few other vegetables. It's good to eat beetroot paratha for breakfast as well as for lunch.